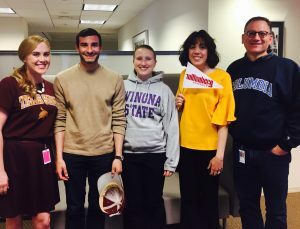 College Signing Day 2018: Celebrate Students in Your College Gear! College Signing Day is almost here! This year, we will mark the event with our friends from Better Make Room (and their friend Michelle Obama!) on Wednesday, May 2. We’ll be showing solidarity by wearing our college gear in support of students who are pursuing their higher education dreams and making the transition to college. The world #BetterMakeRoom for these students! What is College Signing Day? It’s a national movement where communities, schools, and organizations rally around high school seniors as they make their commitments to a professional training program, a community college, a four-year college or university, or the military. As part of Mrs. Obama’s Reach Higher Initiative, this movement is a way for educators, counselors, and parents and families to cheer on students committed to pursuing higher education, and as part of Better Make Room it’s also a way for students to inspire and encourage each other. This year, the official College Signing Day will take place on Wednesday, May 2 in Philadelphia at Temple University. This is the fifth consecutive year that Mrs. Obama has celebrated College Signing Day, and she will be joined by 8,000 Philadelphia students and celebrities including Zendaya, Ciara, Robert De Niro, Nick Cannon, and Kelly Rowland to name a few. How can you show your support and participate? Wear your college gear on Wednesday, May 2 and share your photos using the hashtag #CollegeSigningDay tagging @BetterMakeRoom. P.S.–We’ll be live tweeting from the event. Following along @ACTEquity.